Dually's are a special breed of trucks. They are truly the workhorses of all pickups and anyone that owns a dually had some special use in mind and are a special breed of themselves. Mud flaps for a Chevy dually (Ford and Dodge too) are required by law in most states because rocks get caught in between the two tires and then get flung back into traffic and break windshields and dent grills and all that kind of stuff so be responsible and make sure you have a set of dually mud flaps on your truck. Most dually's have mud flaps already but whenever you "bump" into a curb (even mud) when you're backing up ... rips em right off! I have always thought that there needs to be some kind of bracket that will allow them to be "pulled out" instead of "ripped out" so you could simply reattach them and not have the expense of a new set. Any entrepreneurs out there? Its a big market! There are a number of styles you get to choose from and a number of decorative stainless steel weights to personalize your truck. Not everyone sees your new dash kit or billet pedals but everyone sees your flaps! Go Industries offers the finest custom fit mounting brackets, mud flaps and accessories for Dual Wheel pickup trucks. Easy installation. Also available: stainless steel mud flap weights. chrome and black anti-sail brackets. All Flaps measure 18" X 24". 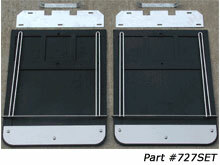 The complete Dually Mud Flap set includes one pair of mounting brackets, one pair of mud flaps, one pair of weights and one pair of chrome anti-sail brackets and the complete Stainless Dually set includes one pair of mounting brackets, one pair of mud flaps, one pair of weights and one pair of chrome anti-sail brackets. Go Industries Mud Flaps are available in Bright Diamond Tread sets too. All sets includes one pair of mounting brackets, one pair of mud flaps, one pair of Bright Diamond Tread Stiffeners, and one pair of Bright Diamond Tread Weights. The stainless steel weights come in the shape of Texas, Oklahoma, Louisiana or Montana. Longhorn and a standing horse too. Husky makes dually splash guards as well. These mud flaps are custom molded to fit trucks and SUV's. Now available for dually trucks. Not only will Husky Mud Flaps help protect the side of your vehicle from rock chips, they help keep it clean from mud and tar. This is one of the least expensive ways to keep your truck looking great. The front units work very well to keep mud and slush off of the factory running boards. Great looking, functional and easy to install; these units come in a standard black finish and the material is paintable. Sold in pairs; Made in the USA! Now that you have everyone looking at the back of your truck ... it may be time to add the "Line of Fire" light bar by Toucan. This slim designed bar features plenty of high intensity LEDs that can be used as brake lights, turn signals, or even intensified exterior lighting. The rod was created for exterior use and is made to fit between the bed of the truck and the rear bumper. The rod is constructed with waterproof casing and is supplied with rust proof stainless steel screws to ensure a long life and a lasting appearance.